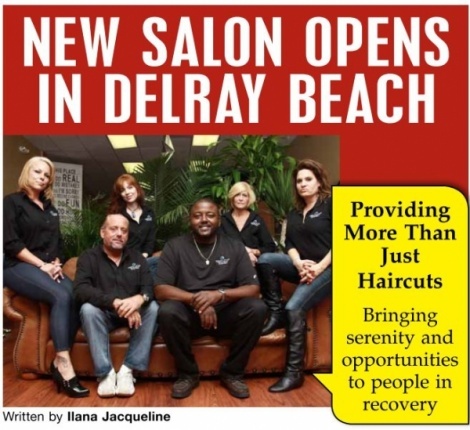 Delray Beach, Florida—When salon owner Don Prince was himself in treatment for addiction he realized and appreciated just how difficult it is to overcome addiction after a 30 year battle with alcoholism. He developed a respect for others in recovery, and for the counselors and other staff who gave their support, care and time. It was during this time that he was inspired to start a business to encourage others who are working through the recovery process, and give them a chance to be creative and do what they love again as artists in the cosmetology industry. In December 2011, Serenity Styles Salon opened its doors in The Congress Square Plaza, Atlantic Avenue and Congress Ave, Delray Beach, Florida. This full-service unisex salon is designed to be inviting and even calming to its clientele. Prince offers a warm, inviting atmosphere for both his stylists and their clients. They work in a low-pressure, supportive environment as a close-knit team, each giving support and encouragement throughout their workday. Prince offers regularly scheduled group therapy sessions to his employees with a licensed therapist as an added bonus for their dedication to both the company and their recovery. “I have been very fortunate to have assembled an extremely talented and diverse staff of professional stylists, all of whom are dedicated first and foremost to the clients of Serenity Styles. Their levels of expertise range from platform artists, color specialists, master barbers, braiding and extension specialists, salon and barber school educators and specialty haircut experts,” states Prince. But what sets them apart is the almost tangible motivation to succeed and to help others that permeates the place. The staff is much attuned to the fact that as a team they all count on each other to be successful. They cater to their clients and truly enjoy interacting with every person who comes in. In addition to their regular customers and walk-ins, Prince has reached out to nearby recovery facilities to alert them to his offerings. Serenity Styles offers men’s cuts including a full menu of barbering services, women’s cuts, color, braiding, up-dos, eyebrow shaping and more. They carry the full line of Redken and other top quality products. “Bring the body and the mind follows takes on a whole new meaning here,” states Prince.